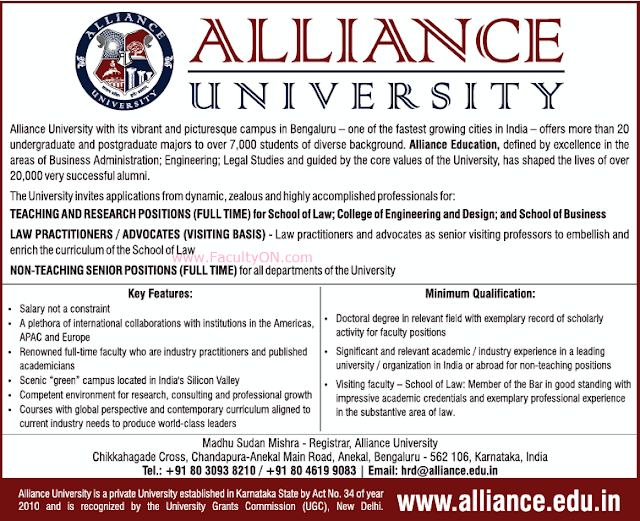 Alliance University, Bangalore has advertised in THE TIMES OF INDIA newspaper for recruitment of Faculty Plus Non-Faculty jobs vacancies. Interested and eligible job aspirants are requested to apply immediately from 10th October 2018. Check out further more details below. About University: Alliance University is a private university that was established in 2010 in Bangalore, India. Since 2014 it has had a fluctuating leadership and been the subject of legal disputes.